AutoGearhead: Audi has unveiled a unique A1 at the Tokyo Motor Show: Glistening in the colors of the Japanese national soccer team, the Audi A1 SAMURAI BLUE shows Audi’s respect for the Japanese national soccer team. Audi plans to sell the SAMURAI BLUE as a one-off model and donate a part of the profit for a charity. “Blue Samurai” is the nickname for Japan’s national soccer team. Blue and white are the colors of the soccer jerseys for both men and women. The Japanese men are the reigning Asian champions, while the women have been even more successful in the world soccer arena: this year they won the championship title in the World Soccer Cup held in Germany. Blue and white are also the colors of the Audi A1 SAMURAI BLUE, accentuated by the red of the Japanese flag. The 18-inch wheels with their exclusive polygonal design are likewise painted red. The interior equipment is black, with contrasting stitching in blue and corresponding colorful accents for the air vent nozzles, inlays, center console and floor mats. With its powerful 1.4 TFSI engine and 90 kW (122 hp), the A1 SAMURAI BLUE has strong acceleration and high speed, while the sports suspension with 225 millimeter wide, 18-inch wheels give the car the agility of a top league soccer star. 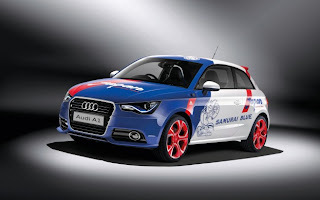 An Audi A1 Limited Edition is also planned to sell in 2012, with its design based on the SAMURAI BLUE. Thank you for sharing! Cool car!